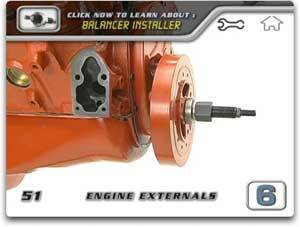 A universal tool for installing harmonic balancers upon the end of an engines crankshaft. Using different adapters with various sizes and thread allows it to work on a variety of crankshafts. 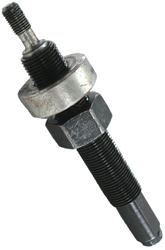 A bolt connects the threaded adapter to the shaft, and a thrust bearing slidably mounted upon the shaft is axially forced into engagement with the balancer by a shaft mounted nut. Turning the nut forces the thrust bearing against the balancer pushing the balancer upon the crankshaft. Using different adapters with various sizes and thread allows it to work on a variety of crankshats. You can see the installer tool attached to the end of a crank shaft below. The installer screws into the threads of the crankshaft with the harmonic balancer in between. As it's screwed in, the force presses the balancer against the crankshafts nose.